This Honolulu International Airport guide is for your reference to help make your arrival to Hawaii a welcoming and seamlessly easy one. Compiled here are some tips and helpful information. Because every travel arrangement is different, this is a general guide and your arrival/departure may vary slightly. 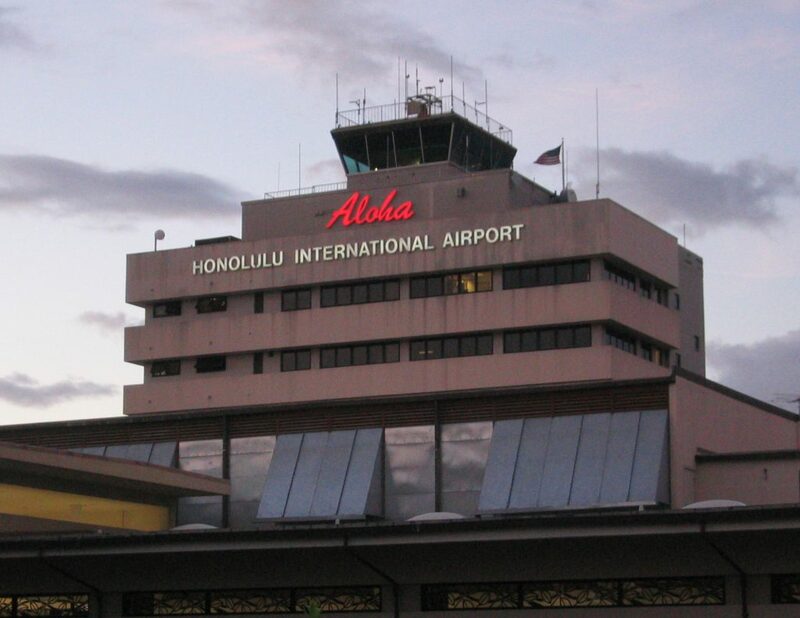 Before you leave on your flight to Honolulu, it is best that you figure out your airport transportation upon arrival. There are several options that you can arrange for your airport transport to your hotel or place of stay. That’s what we are here for. You may reserve with us at Hawaii Car Service for a no hassle first-class Aloha welcoming experience and transportation to your hotel. Before landing at HNL International Airport, approximately 1 hour before, your flight attendants will distribute a State Of Hawaii agriculture declaration form. The form requires you to report any and all organic items that you are transporting. This includes but not limited to plants, animals, and agriculture. If you don’t have anything to report, just simply check “none” and you’re done. The flight attendants will usually collect them right before landing. If you do have a biological organism that you’re transporting, you are required to declare them and you’ll be referred to the quarantine officials that are located near the baggage claim at Honolulu Airport. If your items are deemed “illegal” to bring into Hawaii, you can choose to dispose of them in the Amnesty Bins and move on. If you find it necessary to keep them, ask the officials about what options you have to do so. One option will be to ship it back home via parcel. It’s best to avoid bringing any agriculture into Hawaii to avoid this potential headache. It is a serious matter because there are over 350 species in Hawaii that are identified as endangered and/or extinct. Because flights come to Hawaii from all over the world, there are many species that could be hazardous to the already at risked endangered species on the islands. If you require more information about transporting agriculture to Hawaii or have an item that is in question in terms of “legality”, you may call the State Department Of Agriculture at (808) 837-8413. For transporting domestic animals, you may call (808) 837-8092. We are sad to see you go! To leave you with a warm departure and “Mahalo”, here are some tips for your departure. If you are traveling to the continental U.S. mainland (back to the States), you are required to get your luggage checked-in through an agriculture inspection before checking it into your respective airline attendants. The process is very simple. There are multiple agriculture inspection stations throughout the departure areas of the terminal. They are located right before you get to your airline check-in area. Simply place your luggage to be checked-in onto the conveyor belt and let it run through the scanner. The ag inspector attendants will place a sticker indicating your luggage has been scanned through the agriculture inspection and is clear. You then may continue on to your airline check-in counter. If you fail to do this and head to your airline check-in, you will be directed back to get your luggage scanned through this inspection. It is required, so you may want to save yourself the hassle accomplish this once you arrive at the departure terminal. Every airport there is TSA. It generally takes about 15-20 minutes to get through security. But, it can take up to 90 minutes or more at any given time for reasons that are out of anyone’s control. We recommend that you schedule to arrive at Honolulu Airport at least 3 hours before your scheduled flight time and no less than 2 hours minimum. If you have time to spare afterward, you can enjoy the different amenities around the airport and get your last glimpses of Oahu before you head back home. Honolulu Airport’s amenities are a bit dated. With the newest terminal, the Hawaiian Airlines inter-island terminal, being built in 1993, the rest of the airport even older than that. But, there is a purpose to this, we think. We want you to enjoy your last glimpses of what Hawaii offers naturally, it’s beauty. With natural gardens placed around the airport, you can do just that. Other than that, there is a food court along with other food kiosks around the terminal including a Starbucks. Souvenir shops are also abundantly placed around the gates for you to pick up last minute memorabilia, a magazine, or gifts for your family and friends back home. There are electronic charging stations throughout the terminals. There are outlets that are scattered throughout the gates that you can use if you are fortunate enough to get to them before anyone else. We hope that you found this information useful and beneficial towards your trip to Honolulu, Hawaii. Hopefully, you can plan ahead and make your arrival and departure a seamless one. If you have arranged an airport greeting and limo transfer with us, or a group charter pick-up upon arrival, we will meet you right at your flight’s arrival gate as you exit the airplane. Along with a warm Aloha welcome, we will assist you with every step of your arrival process. Much like most major airports, you will need to travel a distance from your arrival gate to the baggage claim. At Honolulu International Airport you have the choice to take the free Wiki-Wiki Bus and shuttle to the baggage claim. Or, you may choose to enjoy a scenic walk through our open-air airport. While Wiki means “fast” in the Hawaiian language, the Wiki-Wiki shuttle may or may not be quicker to reach the baggage claim – although you do save the exertion of walking. The shuttle busses constantly go to and from each terminal to the main terminal (where the baggage claim is). Just make your way outside of your gate and look for the Wiki-Wiki Bus Stop sign to get picked up shortly. Just keep in mind that it may get crowded at times. One of the notable features of Honolulu International Airport is its open-air design. It’s a necessary feature for people to enjoy Hawaii’s year-round warm climate and beauty. There are also gardens around the terminals for you to be welcomed with or even relax at on your departure. If you would like to reserve an airport transfer with us, you may simply do so here online. Or, you may call 808-926-4444 to reserve a limo over the phone. Also, feel free to browse our website for other services that we provide including Oahu island tours and much more. Mahalo and have an enjoyable trip to Hawaii!